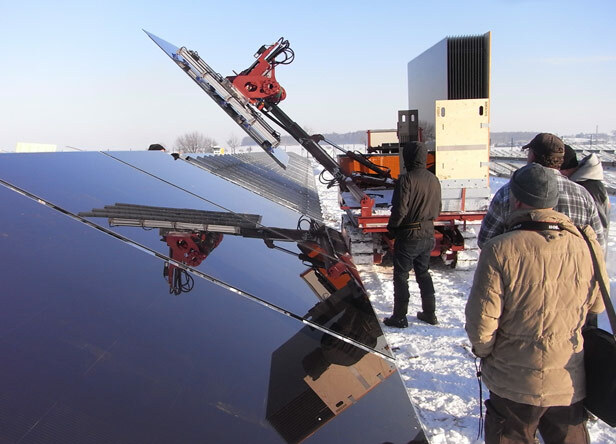 Companies such as PV Kraftwerker and Gehrlicher in Germany are developing mobile robots that can automatically install ground-mounted solar panels day and night, in all sorts of weather, Technology Review reports. The main idea is to save money on labor, which accounts for a growing fraction of the cost of solar power as panels get cheaper. According to PV Kraftwerker, a construction firm specializing in solar parks, installations that used to require 35 workers can now be done with just three workers in an eighth the time.